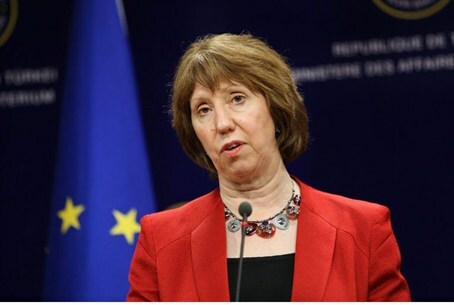 Catherine Ashton says EU expects new government to be headed by Abbas, recognize Israel's right to exist. The European Union on Sunday urged Israel and the Palestinian Authority (PA) to return to the negotiating table, saying US efforts to broker peace must not be allowed to "go to waste," according to AFP. "Negotiations are the best way forward," EU foreign policy chief Catherine Ashton said in response to the breakdown last week in months of efforts by Washington to keep the two sides talking. "The extensive efforts deployed in recent months must not go to waste," Ashton's statement added. "The EU calls on all sides to exercise maximum restraint and to avoid any action which may further undermine peace efforts and the viability of a two-state solution." US attempts to broker a peace deal by April 29 all but collapsed on Thursday when Israel pulled out of the negotiations, a response to the unity pact agreed upon by the PA and the Hamas terrorist group. Ashton said "the EU expects any new government to uphold the principle of non-violence, to remain committed to achieving a two-state solution and to a negotiated peaceful settlement ... including Israel's legitimate right to exist." "The fact that President Abbas will remain fully in charge of the negotiation process and have a mandate to negotiate in the name of all Palestinians provides further assurance that the peace negotiations can and must proceed," she added. On Saturday, PA Chairman Mahmoud Abbas alleged that he would demand that Hamas recognize Israel's existence as a condition in its unity pact, and demand that the terror organization renounce terrorism entirely. “Any government formed would comply with our national agreements . . . to recognize the State of Israel and renounce terror," Abbas said, at a meeting of the PLO Central Command in Ramallah. Hamas officials responded by saying that recognizing Israel's own existence is on the negotiating table, but still subject to change in the context of talks with the PA to form a unity government. Hamas has vowed never to recognize Israel's existence on multiple occasions.